Merry Christmas and welcome to Our Southern Home. I'd like to share with you our Christmas porch. I have snow on the mind. 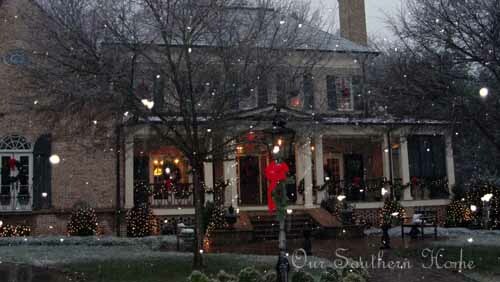 I have big hopes that if I used snowflakes on the front porch that maybe, just maybe we'd have a white Christmas! I know…in upstate SC that is virtually unheard of. BUT…believe it or not, we had that on Christmas Eve in 2010. I am going to start out by sharing those glorious pictures with you. Do you see the flakes? I know, not much! But to us southerners…it was amazing! The kids were so excited! It was a wet snow. Would this confuse Santa and his reindeer? On Christmas morning, we work up to this!!! 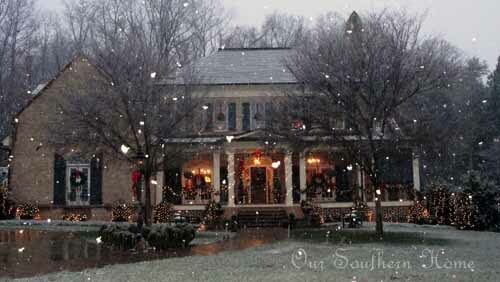 This is a Southern White Christmas!!! Even Lizzie our black lab was celebrating! It was in the 70s the day I took this photo. We have crazy weather here! We can see a beautiful December day in the 70s and quite chilly days in the 30-40s. I am still in the process of furnishing and decorating the front porch. I borrowed this chair from the back screened porch for our Christmas porch this year to create my “Dreaming of a White Christmas” porch. I have been smitten with all of the plaids this year so I have tried to add inexpensive touches here and there. The throw is from Kohl's and the snowflake pillow is from Target. I like to borrow from other areas of our home and use things that I have in new ways. These large lanterns have found themselves all over the place. They usually have candles in them, but this year I added pine cones from our woods, ornaments that I already had and faux snow. The bucket is part of a beverage stand filled with wood, pine cones and fresh greens. The sled is from my childhood growing up in Virginia. I saw lots of snow there! The faux boxwood urns usually grace either side of the front door. I switched it up little this season. The wreath is real! It has really held up well outside. Whoops….looks like I am partially in the picture! All of the snowflakes are from the Dollar Tree. I jazzed them up a bit. I'll share that with you in another post. The wire basket is usually used inside. It is full of fresh greens, pinecones and ornaments that I already had. The pates are usually in the kitchen! The only new purchase in this vignette is the wreath and $1 Tree snowflakes! Each old wreath was adorned with a large Dollar Tree snowflake. I have recently started using Photoshop Elements 11. I am not happy with the way some of the photos were batched edited If you have some tips, I'd love the advice! It is quite the learning process. Hopefully, I'll have it tweaked soon! I wish you and your family a very Merry Christmas! You have such a beautiful home and porch- I love all of your Christmas decor. Wow!!! Just returning from being out of town! What great news! Thanks so much!! I can’t wait to stop by and check out the others. Happy New Year! So beautiful. I live in Illinois and we have had our first snowfall yesterday of the season. My sister lives in Charlotte and I envy her the warmer temps. I hate snow, but I guess if I didn’t have it I would miss it…only a little. Merry Christmas. Terry, so sweet! We have hit or miss snow here. We have had some really great snow falls here in the past. Crossing fingers for one this year. The kids love it so much!!! I can see where if you had it all the time that it would become burnensome! Merry Christmas! Your home is gorgeous, Christy! I am in love with the large porch. Thanks for joining the Open House party and Happy Holidays. Thanks so much Sherry! Love your blog and link party! This is stunning! Thanks for linking up at the party, I’ll be featuring it later today..
OMG, Kristin! Thanks so much for featuring our porch! I can’t wait to stop by and check out the features!!! Merry Christmas! Love, love, love your house! Shelley, you are such a sweetie! Thanks bunches. Merry Christmas and Happy New Year! Oh Christy! I SO wish your home were a hotel so I could come and visit for a few days! It is B-E-A-U-T-I-F-U-L! How on earth did you hang those wreaths on the windows? That red ribbon is STUNNING! Erika, you are so sweet! Thanks bunches!!! I have a long piece of the ribbon looped around the wreath. It was premeasured to the right length based on the window. Tie the 2 ends into a knot. Open the window from the top (inside the room) and put the wreath outside. When you close the window, the knot at the top will hold it in place. I hope that made sense! LOL!!! You have a lovely home, can’t wait to see more of it. We are almost neighbors since I am in TN. Blessing to you and your family for a wonderful Christmas Season. Mary, thanks so much for stopping by! TN is so beautiful! Cheers to a fellow southern girl! Merry Chrismtas and Happy New Year! Thanks, Karie! I hope you had a lovely Christmas! Thanks so much, Lynn. I am looking forward to getting the porch finished with some outdoor wicker and other thrifty finds! Merry Christmas and thanks so much for stopping by! Your home is so pretty! I envy your big southern porch! How magical the snow laden trees look. Beautiful! Snow is pretty rare here too, but I think we just might have some this winter. Have a very Merry Christmas! Thanks so much, Kim! I’ll do the snow dance for you also! Merry Christmas! Your porch is so lovely!! I love your wreaths with the snowflakes in the center. I was just thinking of making wreath for the winter for my windows using the same snow flake in the center. Oh, Debbie ….go for it! The snowflakes were a fast project! Thanks for the sweet words and stopping by! Merry Christmas! Oh, Christy, your home is just gorgeous! Love the snow!! I am in Florida so there is a zippo chance of us getting any of that fun. What a treat for you all! I’m now happily following your sweet blog~please stop over for a visit at my place when you get a chance. Merry Christmas to you and yours! We always cross our fingers for snow…none last year! Thanks for the sweet comments and stopping by! I’ll be by to visit you in a bit, too! Merry Christmas! I adore your porch!! Red ribbon, sparkly snowflakes, pinecones, all my favorite touches! I hope I have a porch someday to decorate as perfectly as yours. 🙂 Glad I stopped by from the Sunday Showcase! April, you are so sweet! Thanks bunches. I hope you have a beautiful holiday season! Tammy, thanks so much!!! That snow really made it down south!!! We are expecting much colder weather here for the weekend, but no snowy forecast. Merry Christmas!!! Lovely! Your home is gorgeous and your decorating is too! The pictures with the snow are pretty! We had snow but it already melted because it’s a bit warm for us right now and I live way up north in northern Michigan! I do believe we are expecting a white Christmas though. I hope you get your wish too! Liz, I am heading your way to celebrate a white Christmas with you!!! How beautiful that will be for you all. Thanks for the sweet comments. merry Christmas!!! You have to love the Dollar Tree. My garland I decorated with some dollars store items. You porch is lovely. Have a great week. Vanessa, thanks so much! Gotta love the Dollar Tree! LOL!! Merry Christmas to you and your family!! I this doesn’t put someone in a Christmas state of mind, I don’t know what would! So pretty!! Thank you for linking up with the Clever Chicks this week; I hope you’ll join us again! Thanks so much, Kathy!!! Merry Christmas! Christy, your porch is just beautiful! What a lovely welcome for your holiday guests! We’re in the same boat for snow. The likelihood is slim to none; but, we also got that fluke snowfall in 2010. Well, we can always dream. Your home looks beautiful! Thanks, Shenita. You are such a sweet blogging friend! We will dream together for that white Christmas again! Merry Christmas! !